March 4 – 12, 2017. Six performances of Family Style (30 min. One Act) at Key City Public Theatre Playwrights Festival in Port Townsend, WA. Written by Mark Rose. Directed by Connor Zaft. Cast: Chuck Filipov, Crystal Eisele, Doug Taylor, Michelle Hensel. June 16 – 19, 2016. Four performances of Showdown at the Temple of Meat at the Greenway Court Theatre, West Hollywood. Part of the “Infidelity ‘n Pieces” One Act Series presented by the Playwrights / Directors Unit of the Actors Studio, in conjunction with the Greenway Arts Alliance. Written by Mark Rose | Directed by John Lacey. Assistant Director Kristopher Lencowski. Cast: Steve Mendillo, Lisa Richards, Kate Whitney, Lane Compton, Alexandra Vino. February 8, 2016. First reading. Playwrights/Directors Unit, Actors Studio, Hollywood, Ca. of Showdown at the Temple of Meat, One Act. Directed by John Lacey. Cast: Jack Heller, Ellen Gerstein, Jennifer Christopher, Kenny Johnston, Stage Directions, Tsulan Cooper. Member of the Playwrights – Directors Unit of the Actors Studio in West Hollywood, 2012 – 2016. April 7, 2014. Reading of Act I of “The Maharini’s Last Game,” through the P/D Unit. See the cast. PRNYC advanced to the semi-finals for the 2014 O’Neill National Playwrights Conference. October 21, 2013. Reading of Act II of PRNYC at the Playwrights – Directors Unit of the Actors Studio, Hollywood. Directed by Wendy Girard. Cast: Rob Reece. Jack Maxwell, Erik Passoja, Teresa Ruiz. Patrick Rieger, Maggie Wagner. September 15, 2013: Reading of the full play PRNYC at Freehold Theatre, Seattle. Act One of PRNYC was presented to the P-D Unit for critique, December 10, 2012. 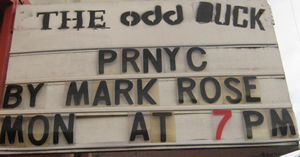 The first staged reading of the full-length version of PRNYC was October 1, 2012 at Odd Duck Studio, now Eclectic Theater, in Seattle. PRNYC, as a One Act play, was a winner in the 16th Annual Port Townsend One Act Playwrights Festival and received 10 performances in February, 2012. It received a Jeffy Award for best one act play of the season. “‘PRNYC by Mark Rose is a taut well-rehearsed script… easily rivaling the popular TV series ‘Mad Men’… A major triumph,” wrote Steve Tracy of The Port Townsend Leader. PRNYC derived from WHITE NOISE, a 10 minute play, that ran for 16 performances at HB Playwrights Theatre and Richmond Shepard Theatre, New York City. THE MAHARINI, 10 minute play, had eight performances at HB Playwrights Theatre, New York City. Scenes from THE CAREGIVERS had a staged reading at Freehold Theatre, Seattle. Playwriting and Acting Scene Study, Donna DeMatteo, Austin Pendleton, Jeffrey Sweet at HB Studio, New York; Elizabeth Heffron, Freehold Theatre, Seattle.